Patrick is an MBA Candidate and Roy H. Park Leadership Fellow at Cornell University Johnson Graduate School of Management. 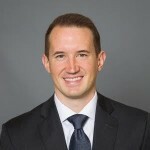 He is leveraging his military experience in personnel management, leadership, and operational planning to pursue a career in strategy consulting.Since graduating from the University of Minnesota with a B.S. in Applied Economics and B.A. in Political Science in 2010, Patrick worked as a Surface Warfare Officer in the United States Navy. After completing Officer Candidate School with distinction in January 2011, he reported as the Strike Officer aboard USS SHOUP, a guided missile destroyer in Everett, WA. During his tenure on USS SHOUP, he managed multiple divisions and warfare areas including Tomahawk missile operations, engineering programs, safety, and shipboard morale to name a few. In 2013, he deployed for 313 days to the Sea of Japan and Persian Gulf in support of maritime security, theater cooperation, and contingency operations.Patrick concluded his military career as the principle Naval Surface Fires Liaison to I Marine Expeditionary Force in Camp Pendleton, CA. In this role, he was regarded as the subject matter expert for naval planning and fire support coordination to the United States Marine Corps, and helped develop new procedures for improved Navy-Marine Corps integration.